Have you ever tried to come up with a concise definition of worship? 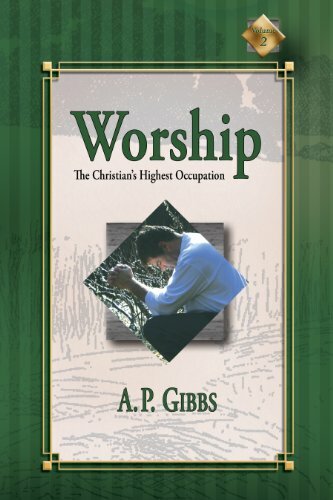 This WORSHIP QUOTE OF THE WEEK comes from the first chapter of WORSHIP: THE CHRISTIAN'S HIGHEST OCCUPATION by A. P. Gibbs, (Walterick Publishers). The term, "worship," like many other great words, such as "grace" and "love," defies adequate definition. The meaning of these words, like the exquisite perfume of a rose, or the delightful flavor of honey, is more easily experienced than described. "Worship is the overflow of a grateful heart, under the sense of Divine favor." Here the writer has emphasized the fact that worship is a spontaneous thing. It is not something which has to be laboriously pumped up, but that which springs up, and overflows from a heart filled with a sense of the greatness and goodness of God. . . .
"Worship is the outpouring of the soul at rest in the presence of God." Here the accent is on the spiritual condition of the one who worships. The believer is at rest. . . .
"Worship is the occupation of the heart, not with it's needs, or even with it's blessings, but with God Himself." Here the distinction is between prayer, praise, and worship. . . .
"Worship is the upspring of a heart that knows the Father as a Giver, the Son as Savior, and the Holy Spirit as the indwelling Guest." . . . .
"Salvation is something received by us as a free gift from God (Rom. 6:23). Worship is something presented by us to God, as a willing acknowledgment of our deep appreciation of what He is, and all He has done."